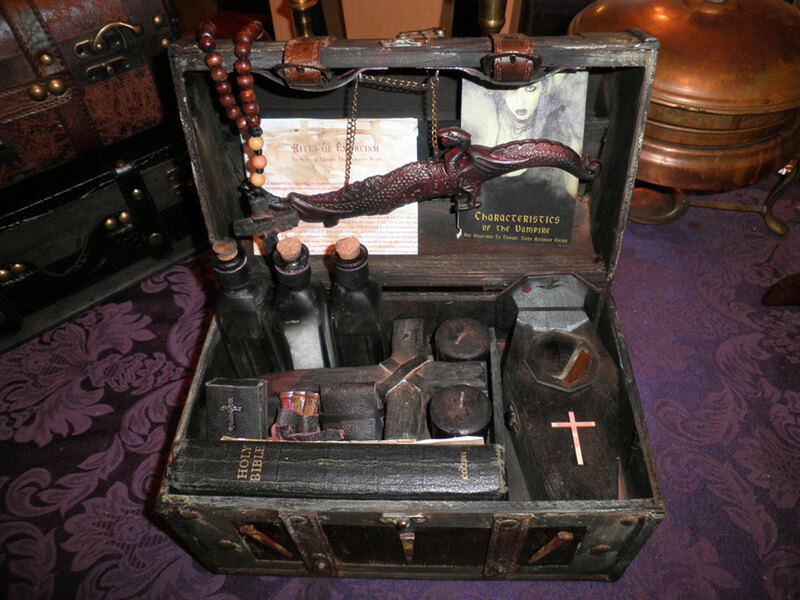 Mid 19th Century Style Vampire Killing Kit “Elizabeth”, by CRYSTOBAL. This antique style unique kit contains a fantasy dagger, and coffin-shaped garlic box. This is a two-level kit with the mallet in the bottom. Also included are the hand-made rosary, bottles of Holy Water, rock salt and consecrated Earth, and three hand-hewn wooden cross stakes (a CRYSTOBAL trademark). This large-sized kit was specially made for the public market, and was sold on eBay for $497. Vampire Killing Kits were very popular in the late 19th and early 20th centuries, so the legend goes. Well-made kits were sold to respectable travelers setting off from the United States and England, and usually consisted of a single-shot pistol with pure silver shot, a crucifix, a bible, and several small vials of holy water, garlic oil, secret serum, etc. But those dainty, delicate kits were really made as display curiosities, not for real vampire hunting. But what if there were real vampires and vampire slayers at the turn of the century? Don’t you those hunters would have carried something much more practical? Of course they would have. Several sharp stakes, large bottles of holy water and rock salt, full cloves of garlic, candles, and a ready-reference exorcism prayer would have been among their basic needs. That’s where CRYSTOBAL draws his inspiration from…from the useful, necessary pieces needed, contained in a lightweight, portable case. This is what sets CRYSTOBAL’s Vampire Killing Kits apart from the unimaginative kits often found today.